NANO MARKET, MICRO MARKET: Just where are we going? Micro markets have experienced dynamic growth for the past several years. Many, if not most of us have been unenthusiastic spectators. We comment on its success saying things like, “it will never work”, or “I like what we are doing now”. Now we are being dragged kicking and screaming into this vast new way of servicing the customers and growing the business. We at All State Manufacturing have experienced many of the same feelings and hesitations as our vending customers. I guess you could say our local Vending Operator Andy convinced us to “join the party”. Andy said “I need help, I need you to build me some metal stands for my Micro markets that won’t fall apart”. Of course we said “we can do that that is what we do.” We were dragged into this new area of vending just as you will be someday. There have been so many articles and we have talked with numerous customers on both the benefits and drawbacks to this new phase in the marketplace. I am sure many Vending Operators are feeling exactly like the drug stores did when coin-op vending machines first came on the scene. “What happened to our sales, “where did the customers go”, “I don’t understand I haven’t changed anything”? What is a Nano-market? As the title indicates, and I did not make up the title, it is just a really small Micro-market. With just one cooler and one or two All State Mfg. Co. stands you can offer a very wide variety of products in a small space. Then add a little software, hardware, plus security cameras if necessary, and you are in business. The market below has it all in less than 12 feet of wall space. Well maybe, just maybe, it’s the customers who are changing. Micro markets are easier, faster, and more convenient, offer a wider selection, and at times are less costly for the customer. Tell me again why you think your coin-op business is off. The operator that puts an expensive card reader on their coin-op machines thinking that will solve the problem of declining sales is addressing only a portion of the opportunities. Well let me tell you, “Your customers still don’t trust the mechanics of the machines”. Whenever they spend a dollar, they want something for it. However, they ‘know’, that at least occasionally, their purchase will get hung up in the machine and won’t be delivered. 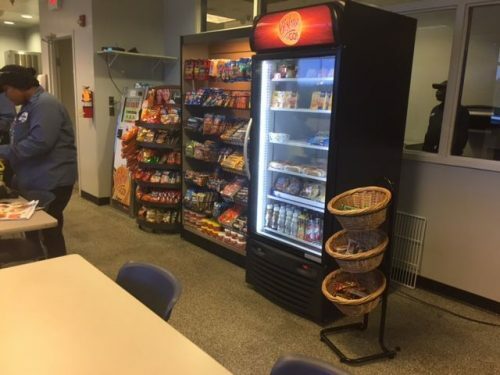 Another advantage for micro markets is that appliance repairmen for coolers and freezers are much easier to find and usually less expensive than the coin op vending machine technician who are becoming more and more scarce. Now comes the “Micro Market”, “Micro-market”, “Micromarket”. Wow lots more selection to choose from, no coin-ops to malfunction, fresher products, your favorite item is always in stock, and you can pay almost any way you wish. So the benefits to the consumer are many. It is just like an unmanned convenience store without the clerk. But I know the Operators are asking, “What is in it for me”? How about increased sales, will that do it for you? Maybe decreased machine repair and replacement costs, would that help? No? Maybe larger margins on your increased sales plus lower costs, does that help any? Lower inventory? Less hard currency to deal with? Lower employee cost? Less machine outage? The benefits are many. Now instead of a $10,000 drink machine, you can use a $2,000 cooler with more capacity and variation. 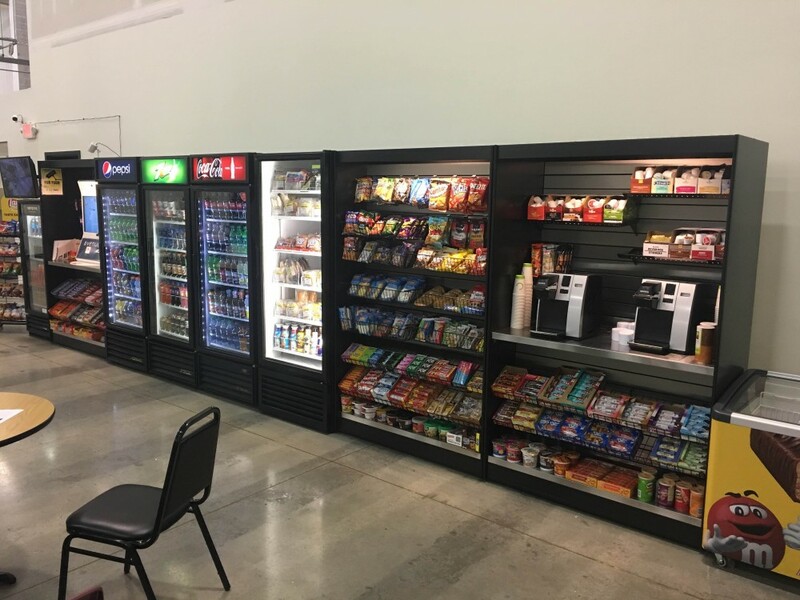 Instead of an $8,000 snack machine, you can use a much less costly All State Manufacturing Company display stand, an MMS491 or MMS271, with more capacity and variation of products. You can offer frozen products with unlimited variety in a low cost freezer. Instead of needing to maintain different pay mechanism on each machine, you only have a single pay station that can and will accommodate many different ways for your customers to pay. By the way All State Manufacturing Co. Inc. offers a stand for your pay center kiosk the MMS492 or MMS272, which also has a lot of display space as well. There are thousands upon thousands of break rooms and lunchrooms that are conducive to Micro markets. It is my opinion most of them will opt for a Micro markets, versus of a bank of coin-op vending machines, because it offers their employees better and more options for both product selection and payment. The Micro market venue can be set up to conserve space. A good display stand like the MMS491 from All State can replace 2 or three coin-op snack machines. A good cooler can furnish refrigeration needs while offering an endless number of food choices. A good freezer can open up a whole new level of opportunities with everything from frozen desserts to frozen dinners. From the very short period of time we at All Sate Manufacturing Company have been serving the Micro Market segment, we can advise vending operators not to ignore this new opportunity. You will ignore it at your own peril. If you do not give your accounts what they want, one of your competitors will. The difficulty is in deciding who, what when and where. This market opportunity, as I see it is currently a cat fight. All suppliers to the vending industries are scrambling for a share of this relatively new opportunity. The cold drink machine manufacturers are losing business to the cooler manufacturers. The snack machine manufacturers are losing business to the display stand manufactures, the best of which is All State Manufacturing Company. Individual machine pay units are losing business to a single pay station. Oh, All State Manufacturing Company offers a great kiosk stand for that pay station. There has got to be some drawbacks to a Micro market and there is. Stealing or thievery is such a temptation. Most operators combat theft with state of the art video surveillance systems and close track of inventory. This is a one-time investment. Several cameras and capability to store the recordings until review is advised in most cases. A quote from an All State customer! We could not have said it better. Best of luck to all who venture into this exciting new market.